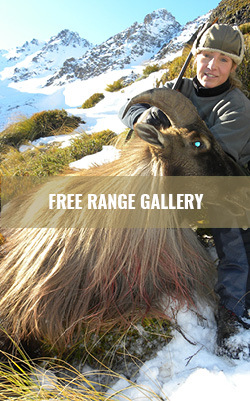 The best free range hunting in New Zealand is on privately owned and managed hunting areas. On these areas the animals are managed for trophy quality and size. New Zealand Trophy Hunting has access to the best areas in New Zealand and we are consistantly producing record book class trophies for our clients. Please note that New Zealand Trophy Hunting holds a legal government concession to hunt on public lands. When considering an outfitter check that they do indeed hold such a concession, as there is a lot of illegal guiding being practised in New Zealand. Our free range hunts are based from lodge, back country huts or tent camps. We will recommend a realistic timeframe for the species and area that you wish to hunt. Access to the hunting areas is by 4WD or helicopter. Most of these hunts require a good level of physical fitness.